Grab your keys and your passport — it’s time to head off on a trip around the world! 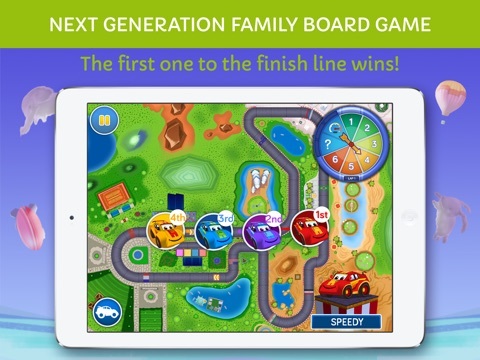 World Racers: Family Board Game will take kids to different cities and countries as they race to be the first car to cross the finish line. 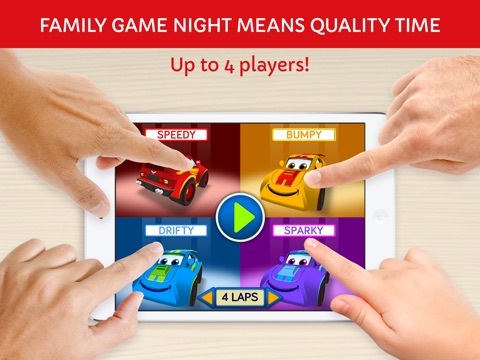 While there’s not much else to the game, it’s a great way to get kids used to taking turns and gives you a way to get your youngest family members involved in Family Game Night. 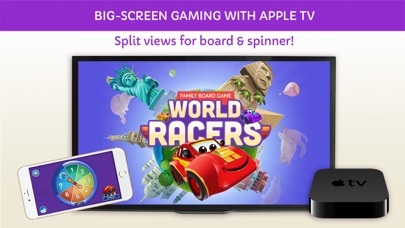 It’s easy to get started playing World Racers. 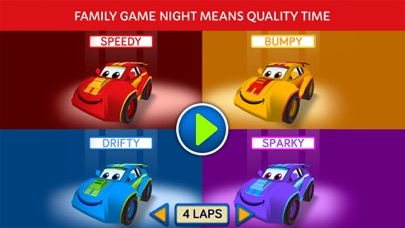 Simply tap on the main screen, and then choose the cars you want to play with. 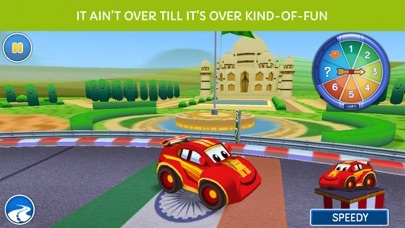 Each game can be played with up to four different cars, which are either controlled by humans or the computer. 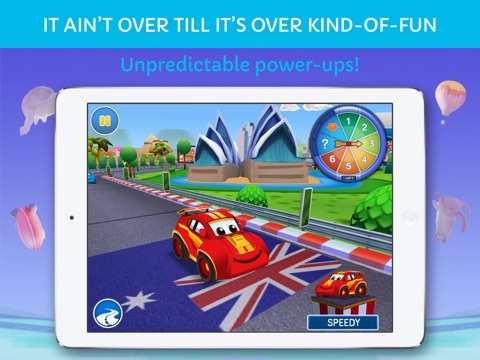 You can also select the number of laps (up to 5) to determine how long the game lasts. Once the game starts, you move by spinning the spinner, just like you would in a real board game. The numbered triangles are pretty self-explanatory – simply tap the circle to move the correct number of spaces. However, a couple of the other triangles are more confusing. 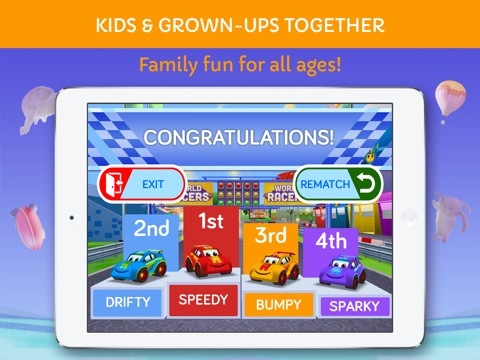 For example, if you land on the ?, the game chooses a destination or other action for your car to complete, but since the game advances your car to the destination for you on this option, it’s hard to keep track of where you’re going. There is a board view option that allows players to see their position in relation to the other cars on the road after a play is made. You would think with a name like World Racers, education and geography in particular would be a focus of the game. There’s little geography in the game aside from a few international flags and pictures of national landmarks. Kids will barely notice them. They will, however, learn some basic counting skills as they move their cars the correct number of spaces. They’ll also learn about turn-taking as they wait patiently for their turn to arise again. Spin and move is the basis of the board game. There isn’t a lot of other actions. 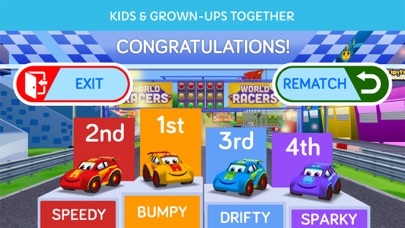 Little kids who love cars will enjoy seeing their cars race around the board and will want to continually check the position of their car to see what place they’re in. 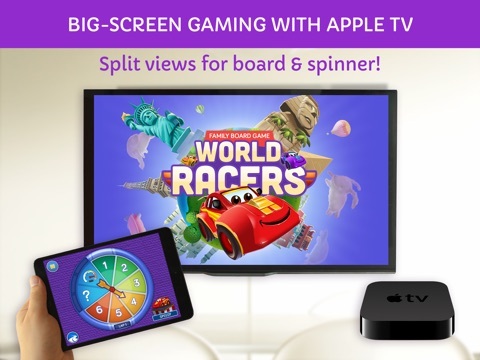 Most of the entertainment, however, will come from sitting around your device and playing a game together. 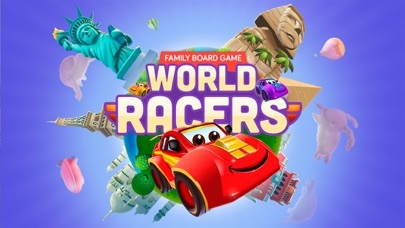 World Racers: Family Board Game is reasonably priced. However, its lack of entertainment value makes its price seem a bit high for what it offers. 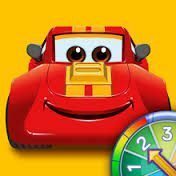 Those looking for a board game appropriate for toddlers and preschoolers, particularly those who love cars, may find it worth a download though.